When it comes to the fabrication of duct work and pipe spools, we use the AutoCD MEP program, combined with an East Coast Cad adder. Each project begins with our designers receiving 3D structural, architectural, and mechanical CAD drawings. We manipulate these to achieve a consistent 0,0,0 insertion point. Once this has been accomplished, we send these drawings to other trades for their input and review. 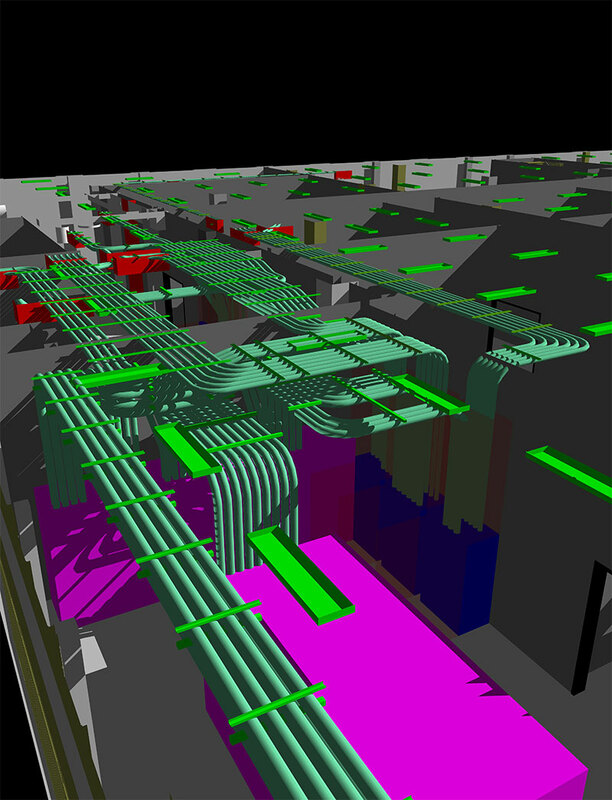 With the aid of Navisworks, we incorporate this information and we begin to draw our duct work, piping, and equipment into the building diagram. If a conflict is found we submit RFIs, (request for information/interpretation) and suggestions for possible solutions. When our drawings are complete, they are submitted to other trades so they might draw around us in CAD. If it is not feasible for them to draw around us, they contact us and we put our heads together to find a reasonable solution for both parties. When the other trades have completed their designs, we gather up all of the trades’ drawings and use Navisworks to build overlays. If any trades discover conflicts, they immediately communicate their issues and corrections are made. This typically takes several attempts. But when the drawings have been approved, they are signed off by all of the parties. This is when we begin ductwork fabrication drawings, and spooling pipe for our shop. Vaughn Industries is a Design Assist and Design Build contractor – using our strengths and knowledge to both design and/or build a project from the beginning drawing stage to the final installation. 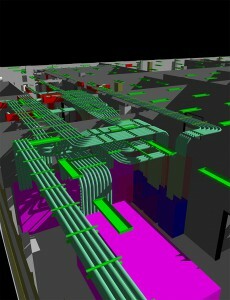 We offer full service 3D coordination through AutoCAD MEP and AutoCAD Architectural Desktop. 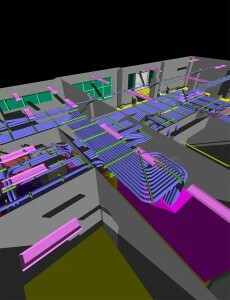 Both programs are Navisworks compatible and can be utilized throughout the BIM process. We have the ability to model the building structure to include: beams, joists, walls, doors, windows, ceilings, lights, slabs, etc. We can then use this model (or use models provided by the A/E) to find routings and placements of electrical, plumbing, sheet metal, steam and hydronic piping systems. All of these models are built on an AutoCAD platform and appended into Autodesk Navisworks for viewing and collision checking. Once all collisions are cleared up and all of the drawings are signed off, we start the fabrication process. All projects will include a plan view 30”×42” color drawings of the building in 1/4″ = 1′ scale. These drawings can be customized in color, dimension styles, etc. to meet your needs. Other options VI offers is wall penetration drawings, steel roof and floor penetration drawings, pad layouts, underground, etc.